Fifteen Palestinians were killed and more than 750 were wounded by Israeli troops Friday during a march to the border of Israel and the Palestinian territory of Gaza. It was the deadliest day Gaza has seen since the 2014 cross-border war between Israel and Hamas. Friday marked the first day of what Hamas organizers have said will be six weeks of daily protests against Israel's border blockade. Protest organizers say they aim to bring attention to Palestinian demands for a right of return to what is now Israel. A large majority of Gaza's 2 million people are descendants of Palestinians who fled or were driven from their homes in the 1948 Mideast war over Israel's creation. The right of return demands that relatives of refugees who lost their homes in 1948 be able to regain their property. The Israeli military accused Palestinian militants of using the cover of protests to carry out attacks. It said thousands of Palestinians threw rocks and rolled burning tires toward Israeli soldiers on the other side of the border fence. It also said that in one incident, Palestinian gunmen fired towards Israeli soldiers. 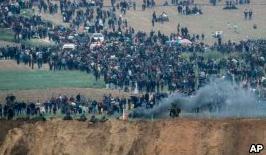 The large turnout of flag-waving marchers in the dangerous border zone demonstrates Hamas' organizing skills. But it also demonstrates Gaza residents' growing dissatisfaction after a decade-old border closure. Life in Gaza has worsened in recent months, with rising unemployment, poverty and daily electrical shortages. Lastly, while I still have an audience, I would like to bring attention to an alternative food and energy source. I don't aim to hurt you. Police say they believe the attacks were carried out by nationalists. Extensive advertising can cause a factitious demand for an article. 5.The right of return demands that relatives of refugees who lost their homes in 1948 be able to regain their property. If the situation demands,he must be able to attend the meeting. This island was ceded to Spain more than one hundred years ago. They captured more than ten thousand prisoners and large quantities of arms in that campaign.